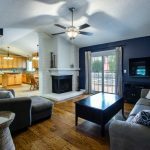 If your home incorporates a great looking, comfortable and beautifully decorated living room, there is no greater pleasure from inviting friends over to gather at the living room and spend some quality time with people that you love. 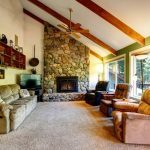 We have collected 40 luxurious and fascinating living room pictures from our collection to get an idea of what we mean by beautiful living rooms from around the world. 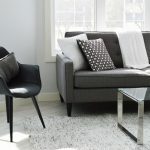 In the design ideas that follow you will find a variety of styles ranging from intricate and modern living spaces to more traditional and classic design elements. 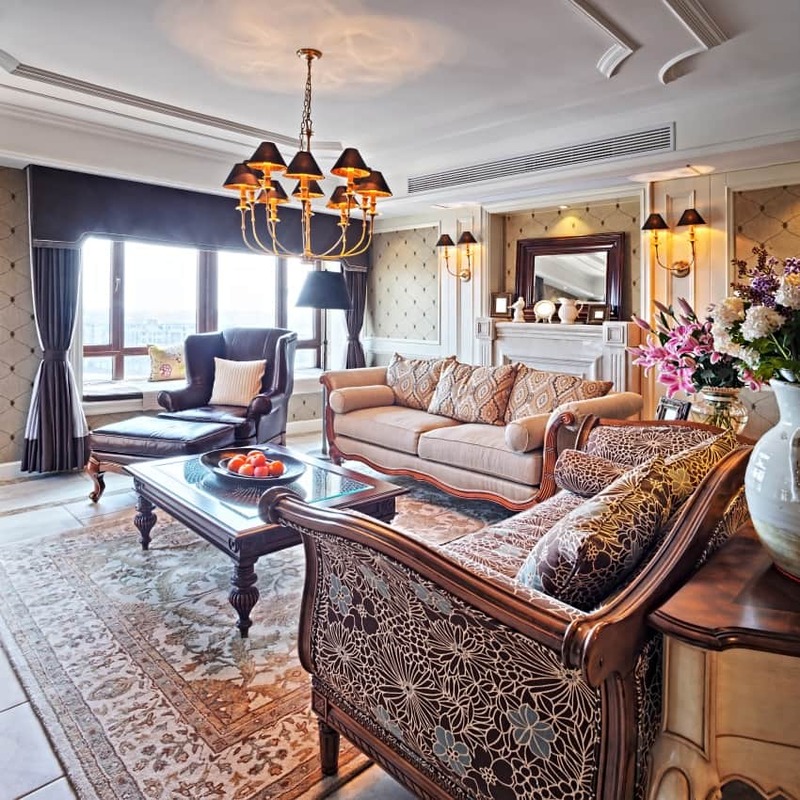 In addition to the exquisite furniture that make up each living room space, pay also attention to the architectural elements of each room and the decoration features that create an artistic atmosphere. 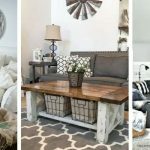 So, we hope you will enjoy our gallery below and ignite your motivation to decorate your own living room space with some ideas from the rooms below. We are sure you will be able to create your own oasis of tranquility, creativity and energy. Please make sure to view all the images until the end and then click the “NEXT PAGE” button to navigate to the rest of the pages. 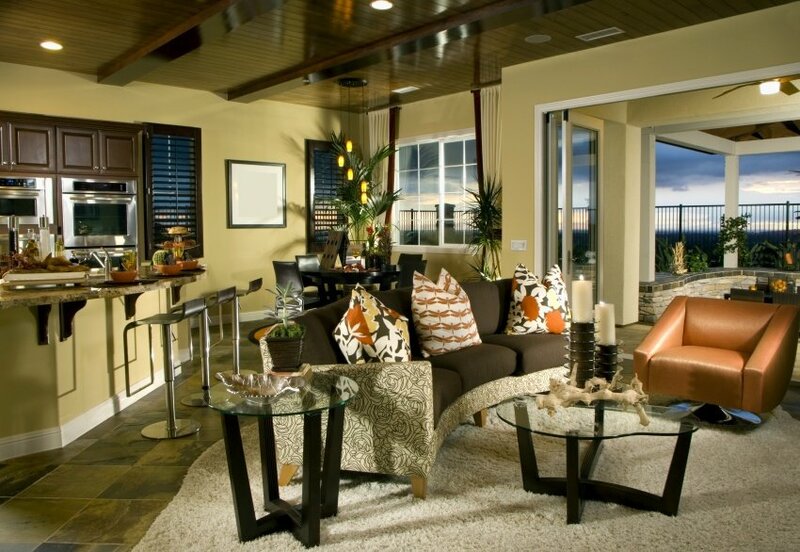 This living space is warm and welcoming. The lighting accentuates the tree in the corner, drawing attention to the comfort of the beautiful velvet loveseat. 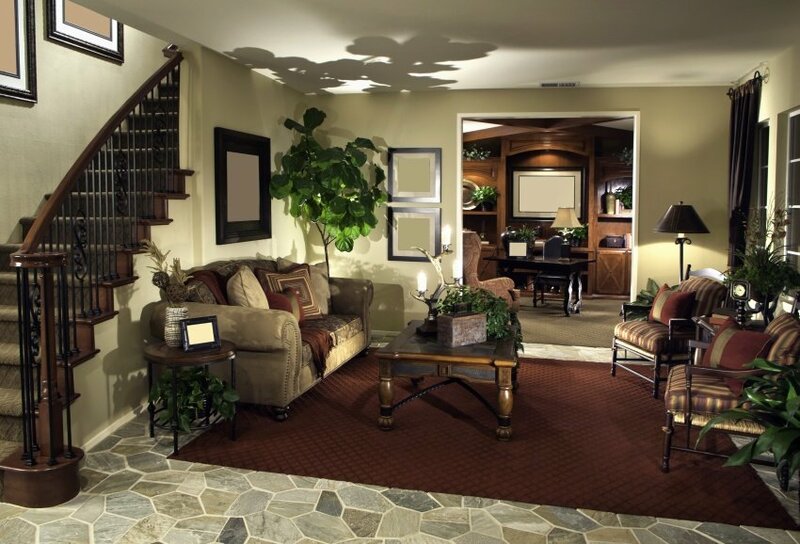 The warm chocolate tones create contrast against the stone flooring. The iron-work adds character and interest to the space. This intricate living space is built for entertaining. The room airs elegance with its beautiful chandelier, art nouveau contours, and powerful patterns. 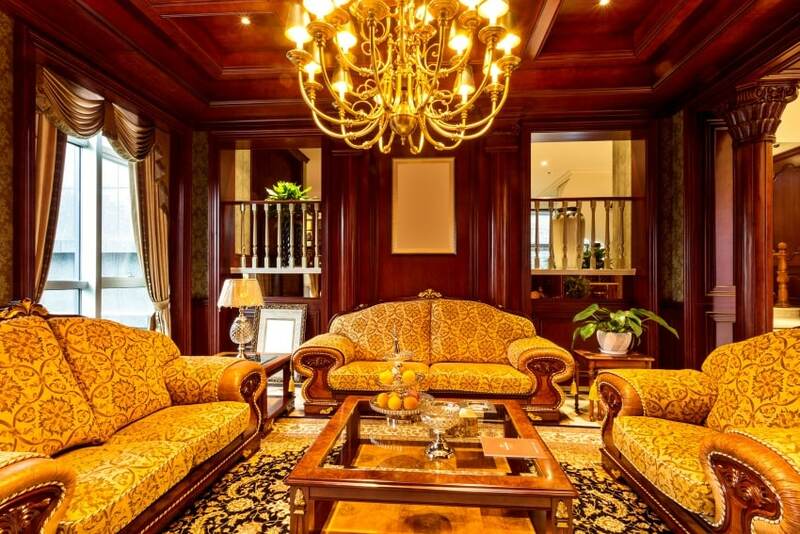 The cherry stained and paneled structural elements create an exquisite sense of royalty. The golden fabrics balance the space. This space is guided by simplicity. 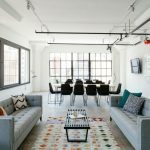 The color scheme is clean and reserved, yet the contrast and patterns contribute boldness to the space. The soft arch between the dining and living areas allows the room to remain open, but provides division between the two areas. This space is an international beauty. The low setting furniture, paper screen wall art, and sienna tan fabrics suggest origins from the Middle East. Meanwhile, the spindled island leg, diagonally tiled flooring, dark stained woods, and arched walkway suggest a more European style. This living space flawlessly intertwines modernistic and Queen Anne decor. 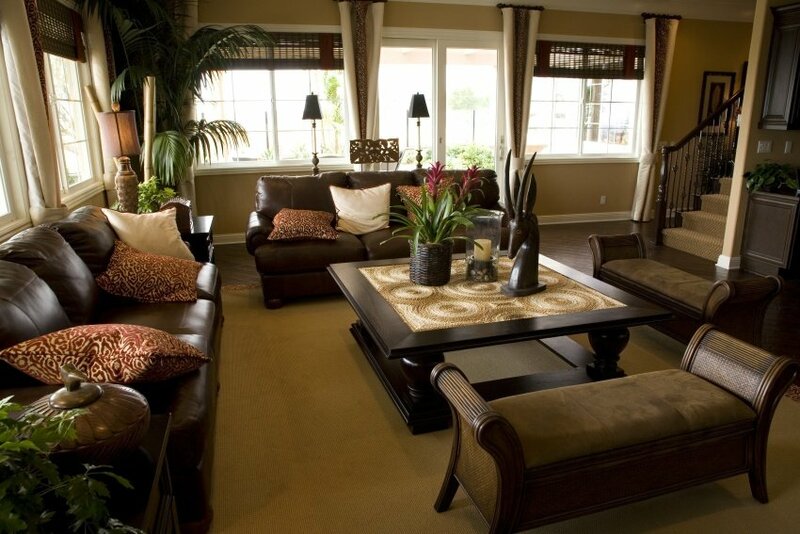 Many of the neutral fabrics have texture, adding interest to the space. The sofa is certainly the focal point. 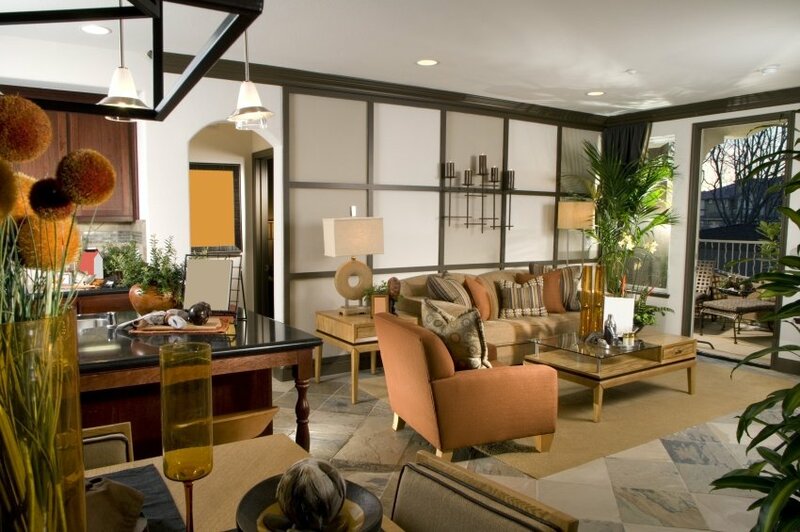 The pillows, surrounding light fixtures, roman shades, and the natural light frame it beautifully. This French Country modern living space is certainly unique. 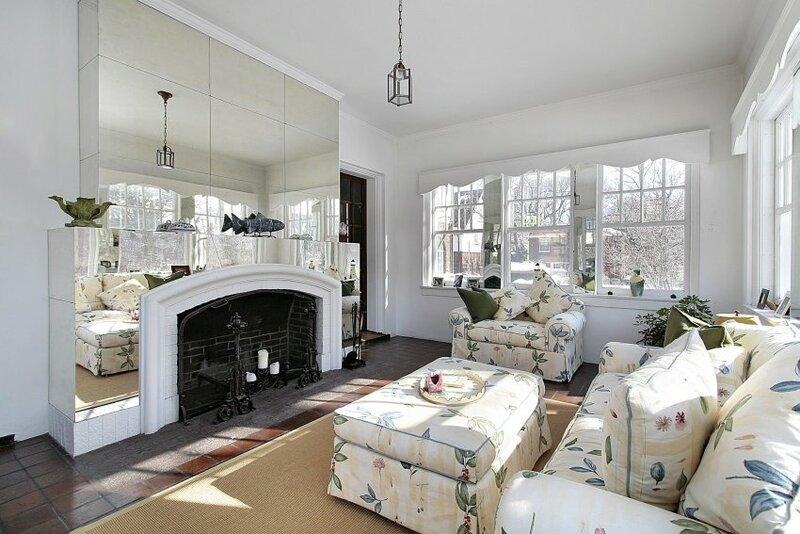 The mirroring of the fireplace and simple valance window treatments allow natural light to illuminate the space. The center-point is the hearth, contrasting against the light. The light floral fabric refreshes the space. This elegant space airs an almost San Franciscan feel. The warm modern elements are interesting and bold against the neutral, clean lined architecture. The curved sofa and asymmetrical glass tables teem with unique style. 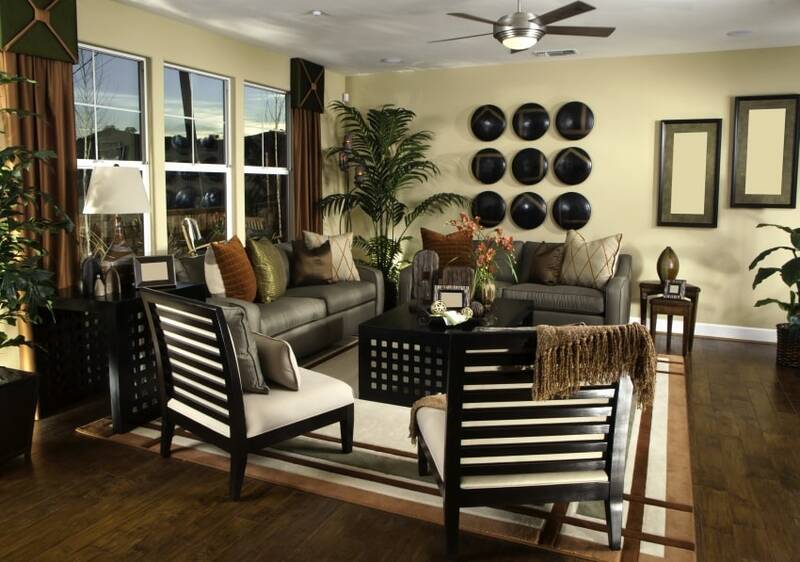 Hints of sienna and grey-brown add deeper warmth to the room. This regal living space is truly traditional. 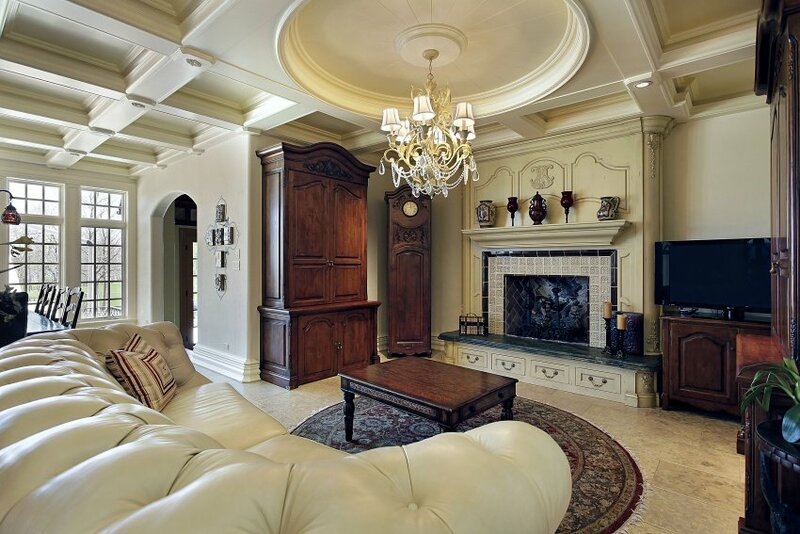 Architectural elements such as the coffered ceiling with a medallion above the chandelier, the fireplace, and the archway add a unique sense of classical style. The beautiful woodworked furnishings and immaculate tufted sofa complete the space. This living space uses unique furniture elements, varying colors, décor, and fabrics to transform the space into a work of art. The ladder-back chairs, latticed tables, and wall art make this space one of a kind. The color scheme truly works wonders, creating radiant warmth. This space tributes 18th century Georgian décor. The wingback lounge chair, carved sofas, and varying floral patterns make this space unique. The window treatment and window seat create additional seating. The trey ceiling and chandelier draw focus to the room’s center. This space reflects elegant 1920’s style and class. 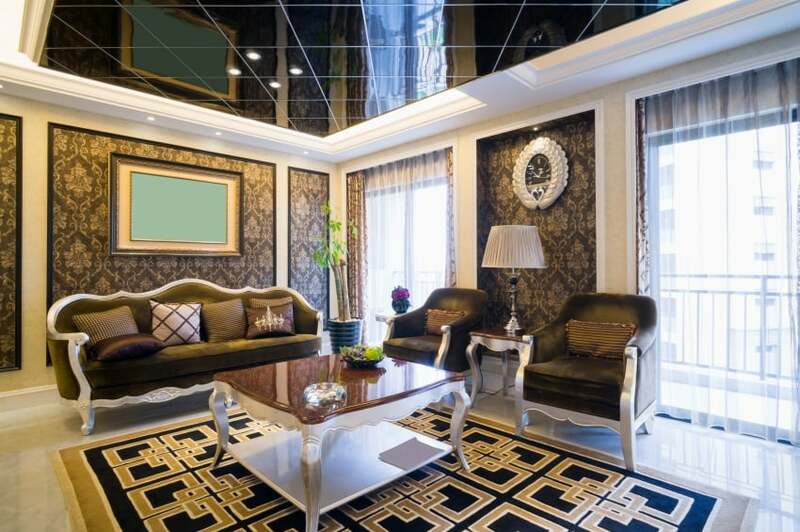 The art deco rug and reflective diamond tiled ceiling spur elegance in the room. The reflective marble tabletop and upholstered velvet carved seating creates a feeling of Victorian elegance. The floral arabesque wall coverings contribute femininity. This living space is traditional and warm. The neutral color scheme allows the focus to remain on the details. 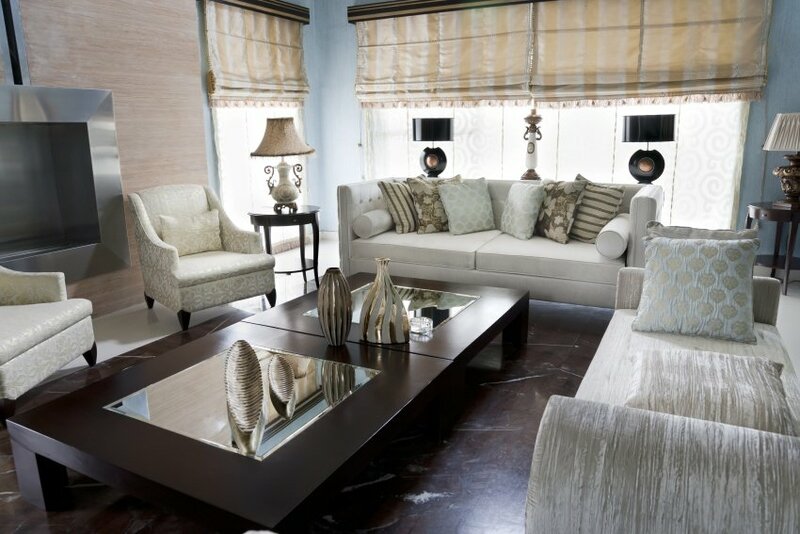 These include the furniture motifs, the subtle fabric patterns, and the various textures throughout the space. The fireplace acts as the center-point. Thanks for your feedback Cora. We are glad you liked the designs.